Yeah, Twitter offers set of plugins for their users to use on blogs or websites. 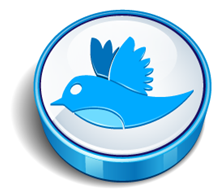 The Follow button is one of popular plugins of Twitter. It allows site visitors to easily follow a Twitter account while they are exploring content on the site. So users don't need to leave your site and they can follow your account instantly. As it allows users to follow a Twitter account, it can display how many followers that Twitter account holds too. In addition, it supports customization options and you can customize the button to comply with your site background. Let's see how to customize and add Twitter Follow button. You just need to add below Twitter Follow button code snippet to your website where you want it to appear. Add your exact Twitter username here without @ sign. Set value true here if you need to show your followers count along with your Follow button. Else specify false. Here you can specify width of the follow button in pixels or using percentage. If you would like to align your Twitter Follow button to right, then specify right here. Else you can left align your button specifying left here. You can either show your Twitter name on follow button by specifying true here or else specify false to add up no Twitter name. Here this code snippet will display large Twitter follow button. Remove this parameter if you wanna show standard sized follow button. If you have already implemented Twitter tweet button on your blog, you don't need to add up this script with this button. If so you better remove this code. Twitter Follow button is available in few languages. Specify the language code of your preferred language you wanna use. The language code formed with two letters and displayed correspond to the each language below. great posts.. thanks for sharing!